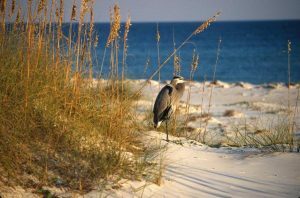 Walk the white sand beaches of St. George Island, and every casual stroll will introduce you to new and different curiosities and pleasures of life in or near the Gulf of Mexico. Whether you come out early to watch a spectacular sunrise or stay up late to see every star in the heavens, our beautiful beach always offers its own special surprises. Some days the beach will be littered with shells -- oysters, scallops, arks, cockles, carditas, and boat shells are among the common finds. Less prevalent are Florida fighting conchs, lightning whelks, fig shells, olives, pen shells, and baby’s ears. Occasionally, especially after a storm, one might find a treasure – a murex, a tulip shell, or a perfect angel wing. At times delicate white clams, still hinged, are the find of the day. Loop a colorful ribbon between the halves and they make wonderful ornaments. Be on the lookout for coquinas – tiny bivalves less than an inch in length with markings in all the colors of the rainbow. They appear at the tide line when the waves recede, then disappear into the sand as the surf covers their ground. In late winter or early spring, you will see sand fleas, also called mole crabs, on the beach or in the surf. Not insect fleas at all, these crustaceans resemble a large white jelly bean with legs, and are the preferred bait for the coveted pompano which are plentiful in the surf in the spring. On other days sponges are everywhere -- gnarly and twisted Dead Man’s Fingers, basket sponges, or vase sponges. Then there are starfish days when symmetric sea stars cover the beach. Or sand dollars, which mostly appear in pieces, but from time to time are whole and plentiful. One word of caution. If your find appears to be alive, let it be. It deserves to live so it can keep on fascinating the next beachcomber who discovers it. And besides, if you take it home, it is likely to scent your world with the unpleasant aroma of sealife decay. The rows of fences that you see near the dune line in many areas are sand fences erected to help rebuild the dunes. Sea oats, beach morning glories, and other dune vegetation helps hold the sand in place. Dunes are a vital part of the beach landscape, and protect our homes from destructive storm surges. Don’t be tempted to pick the graceful swaying sea oats; they are protected by law. Some days the beach is empty and smooth as a baby’s bald head. From time to time, weather and currents bring up batches of seaweed – which guests may find an annoyance but which some locals love to use to nourish their gardens. Then, of course, there are the lively beach inhabitants, that try to defy capture. Like the ghost crabs, skittering to their holes when they notice your presence. While tasty blue crabs are sometimes found in the surf, especially when they are in a mating frenzy called “jubilee,” most of the crabs that latch onto your fishing line or that you see on the beach are brown crabs – which are not good eating. And the myriad of dolphins, rising and falling as they cruise the beach, sing the rhythm of the sea. If you are lucky, you may see them launch themselves airborne in a stupendous spiral. The fishermen, who are a part of the beach characteristic, normally reel in whiting (great eating), or a trout or a redfish, or the unfortunate catfish. 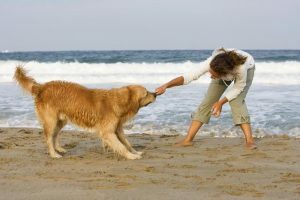 But don’t be surprised when they pull in a small shark – maybe a little hammerhead or a sand shark. Sharks are part of our Gulf community, and are accepted and respected. And then there are the shore birds. Gulls abound, generally looking for an easy meal. Sandpipers and little sanderlings hop about, looking for natural food or a piece of bait shrimp dropped by a fisherman. Great blue herons (most of whom are affectionately called “Charlie”) look for handouts of undersized whiting, and if ignored long enough, may poke into your bait or catch bucket to help themselves. Once in a while, look up instead of down. While much more likely to be spotted on the bay side, a bald eagle might be seen soaring over the beach. Magnificent Frigate Birds, most often associated with storms, are a spectacular sight. Or you might see fighter jets from Tyndall Air Force Base near Panama City maneuvering over the Gulf. During summer months, you will see sea turtle nests on the beach. Female sea turtles nest on our beaches starting in May, and hatchlings are out of their eggs by the end of October. Volunteer turtle patrollers walk the beach each morning during nesting season, and report any “crawls” so that the nests can be marked. If you spot four stakes with yellow tape, that’s a marked turtle nest. Stay away so as not to disturb the nest, and require children and pets to do the same. If you see what looks like tread marks in the sand heading from the water toward the dunes, that is probably a turtle crawl. Female sea turtles, mostly loggerheads in this area, climb onto the beach at night to lay their eggs. They can get trapped in a tangle of beach chairs and toys left overnight on the beach, or fall into a hole dug by an enterprising youngster. These entrapments interfere with the natural order of the island. Don’t let it happen on your watch. One last word about our beautiful beaches: please don’t trash them. Enjoy your time on St. George Island’s beautiful beaches, but please dispose of your beach outing debris. Lots of stuff washes up from the Gulf – usually trash blown off boats. Island volunteers pick up that junk so that residents and visitors can have a beautiful beach to enjoy. Please help us keep the beach beautiful for us all.